Both in commercial cut-flower production and in the backyard cutting garden, fillers and foliage form the backbone of cut-flower arrangements. In addition to providing structure and bulk, they lend design elements which, while less obvious, are as critical in most arrangements as the flowers. They give arrangements a lush, full, and balanced appearance, often offer background color, and tie together all the blooms. Perhaps underappreciated by the casual observer, fillers and foliage are the workhorses of bouquets and indispensable in the cut-flower garden or shop. More often, fillers and foliage make up the larger proportion of material in any given bouquet, so the best ones are easy to grow or source, abundant, dependable, sturdy, and beautiful. Because we often get questions on this topic, I've asked flower farmers from three different regions who grow, design, and market their blooms for some recommendations and tips. Here's what they have so generously shared with us — followed by a few of my favorites! "We are a family farm, using sustainable practices to grow specialty cut flowers for discerning flower lovers throughout the Pacific Northwest, from Eugene north to Seattle. We are passionate about growing the highest quality, most unique and interesting flowers that we can — we're just flower nerds!" Erin McMullen, her husband Aaron Gaskey, their two boys and Roscoe, the farm dog, grow over 60 types of cut flowers on 3 acres of their farm in the Willamette Valley. Starting out with an ambitious backyard garden, they've been growing now for over 15 years. Erin and Aaron love to share what they've learned along the way. Especially if you're just starting out, they recommend selecting crops that are both easy to grow and versatile for different market types, from the roadside stand to bridal bouquets. 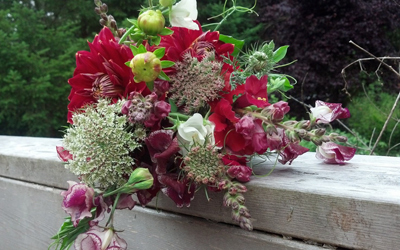 The airiness and delicate detail of this bouquet are enhanced by Ammi. Both statice and feverfew hold up well for us at the farmer’s market, make a bouquet look and feel full, are super easy to grow, and continue to produce over a long period of time — though we do succession-plant to guarantee fresh blooms throughout the season. Erin and Aaron gather salal and ferns from wooded areas on their farm. 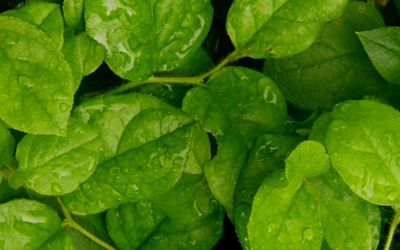 Salal is an evergreen understory shrub with strong stems and leathery leaves, native to the Pacific coast and hardy in USDA zones 8–10. Bells of Ireland has such a unique color, and a great arching habit that makes it a must-grow crop for our floral designs. Raspberry foliage, salal, scented geranium and ferns are all great "greenery" for laying the foundation for all types of bouquets. Upright-form amaranths, like 'Hot Biscuits' and 'Red Spike' (pictured above) are generally more useful and versatile as filler than the trailing forms, which are more suited to tabletop arrangements and bridal bouquets. Ammi/Daucus give bouquets an airy look and delicate detail. We love using them! We use sedum throughout all its stages — green, pink, brown. It lasts forever and makes a great foundation. Amaranth and broom corns are indispensable in fall bouquets, but both can be used throughout the season to add interesting shape and texture to bouquets. … so many things that are great! Stacy's focus is on the flowers, which she arranges for weddings, special events, corporate accounts, and wholesale customers. She also finds beauty in old wood, rusty metal, and all the fruits of her family's labor. 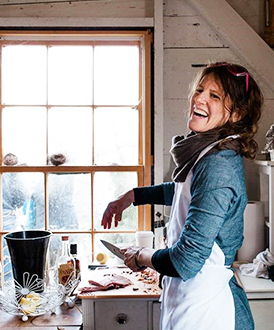 She's devoted to understanding and improving farmland preservation, farmland tenancy arrangements, and organic agriculture as an economic driver for the state of Maine. 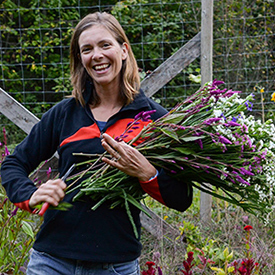 Stacy is also a newly minted Maine Organic Farmers and Gardeners Association Board Member. 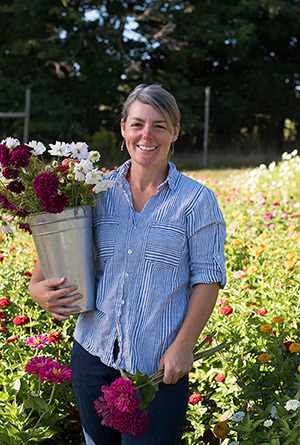 Farming in Maine since 2002, Stacy Brenner lives, farms, and flowers at Broadturn Farm with her husband John Bliss and two daughters, Emma (21) and Flora (10). They raise cut flowers and organic vegetables, host weddings, and operate a summer day camp that focuses on connecting a young community with where nutritious and sustainable food comes from. We seed 128-cell sized trays in the greenhouse at 3–5 seeds per cell, without thinning. We keep the trays a bit dark and cold, allowing them to dry a bit between each watering, for about 2 weeks. Then, we set them onto bottom-heated tables with soil probes set at 65°F/18°C. Note: Our recommendation to direct-seed early is based on bupleurum disliking hot temps. Stacy is able to be successful by keeping the transplants cool in the greenhouse. A wonderful first flush of foliage to use in arrangements with peonies. Started in the greenhouse, the first succession of bupleurum transplants go out into a high tunnel as early as possible. We plant them 6x6 in well-amended beds. Successions of bupleurum are started every 2–3 weeks. One of my favorite fillers grown from seed. This euphorbia has a nice long vase life if hydrated rapidly after harvest. Also, mid-summer foliage does well if the field heat is removed as quickly as possible. One caveat: Some of us on the farm have a reaction to the sap produced when the plant is cut, prompting the donning of gloves during harvest and bouquet making. The end result is worth it, and customers rave over the charming variegated green foliage. We grow multiple successions, seeded in 128-cell flats at 3–5 seeds per cell, planted out at 6x6-inch spacing. We plan and plant the last succession to produce its diminutive white blossoms just prior to the frost. Lady's Mantle stitches late-June CSA shares together with a lace-like web of chartreuse. Our 75' bed of Lady's Mantle pumps out a sweet, useful filler for a few weeks each spring. This perennial for us is long lived, and the initial investment of bare-root starts has more than paid off. Mountain mint and baptisia are both long-lasting herbaceous perennials in our rotation. We can't get enough of either of them, and continue to increase our plant stock of both. We cut two-thirds of the baptisia blooms in early spring, leaving a third behind for the interesting seed pods to develop for later harvest. Then, over the course of the summer, we harvest two-thirds of the foliage from all the plants, with the remaining third to be cut immediately prior to the first frost in the fall. We use the baptisia seed pods to add interest to fall arrangements. "B-Side Farm sits on one colorful acre next to a small rushing creek in Sebastopol, West Sonoma County, California. We use organic methods to grow a wide variety of old-fashioned, fragrant flowers for use in our design studio and workshops. Full-service wedding design is our specialty, and by growing most of the flowers we use in our designs, we're invested in every aspect of the process, from planting the seeds to caring for and picking the flowers, to putting the finishing touches on the bridal bouquet before it's carried down the aisle (a favorite moment, every time)." Lennie came to farming and flowers from a background in social work and adult education. Naturally, B-Side Farm has quickly become an educational farm where Lennie not only grows and designs with flowers, but teaches others how she's doing what she's doing. 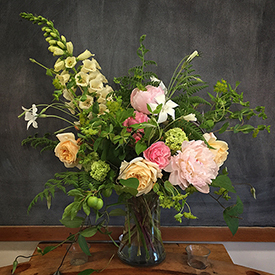 B-Side Farm workshops are designed to meet every student on their own plane and encourage them to delve a little deeper into the world of flowers — whether in the garden or design studio. The B-Side Blog is a growing resource for both of these arenas. I rely heavily on foliage to create the loose, sprawling, wild look I'm after. In any given wedding arrangement, I'll be satisfied if I include three different types of foliage — but I'd be even happier with five! I'm always re-thinking the varieties of foliage I grow, buy, and forage by judging them on two virtues — first, being easy to find, and second, providing something unique and of interest in the design. The ideal will have some small leaves, some big ones, some thin arching stems, and some more sturdy. In other words, the more variety across the board, the better. 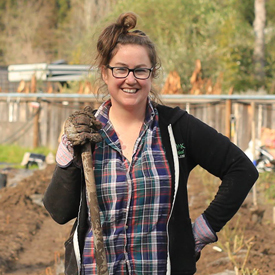 Lennie is also the West Coast Director for the Association of Specialty Cut Flower Growers, and teaches flower farming and horticulture at Santa Rosa Junior College. I love these basils for how well and how long they hold up, and the heft as well as gentle curves they add to arrangements. It's so nice to grow so much bulk from an annual seeded crop. The purple is stunning and can either accentuate a purple color scheme or easily blend with other colors. So easy to grow from seed (as long as you remember that it needs dark to germinate! ), bupleurum is one of those crops I'd be smart to succession-sow every week or two on the farm. It adds such great movement to arrangements and it just SHINES! In my area, bay laurel is abundant, and it's been easy to connect with local ranchers who will let me sustainably forage it from their properties. It makes a great base for many arrangements, and has been key in making garlands. 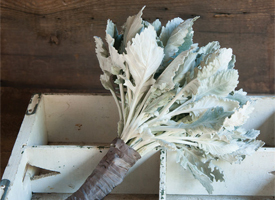 Harvest Note: To avoid wilting, wait to harvest Dusty Miller until late maturity, when the stems feel and appear woody at base, where you will cut them. As long as I start this early enough, by mid-summer I've got enough hardened-off stems to use in nearly every wedding. Dusty Miller 'New Look' holds up really well, adds a touch of softness to arrangements, and is a great way to bring in that silvery-gray that so many customers are looking for. Do you ever have chicken wire or other mechanics showing through an arrangement when you thought it was complete? Me, too! 'Frosted Explosion' is my secret answer to this problem, and can be tucked into an arrangement on completion, to take up space, mask holes, and provide a touch of glimmer. Olive is another shrub that is easy to grow and cut in my region. For large arrangements, arches, arbors and urns, it comes in handy every time and adds a bit of grace. I like to pretend I'm living on a Tuscan villa and just surround myself in huge swaths of it. Atriplex. 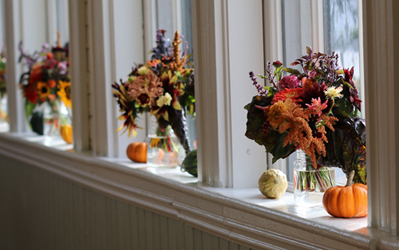 Color and texture especially suited to moody, late summer and fall arrangements with red and bicolored sunflowers and salmon colored zinnias. Mature, sturdy stems hold indefinitely in bouquets. Dill. Easy to grow. Makes bouquets sparkle like filtered summer sunlight. Eucalyptus. Requires a long period (10–12 weeks) for seedling development, but by late summer can be quite productive for fall or winter arrangements and wreaths. Celosia. Plume (plumosa) types are productive and long-lasting for summer and fall bouquets. Mint. Adds wonderful scent and holds up well in bouquets if cut when plants are mature and stems appear woody at the base. Orlaya. Similar in appearance to Ammi but a bit more delicate, with the outer row of petals putting on a show. Rosemary. Too precious to use in most market bouquets but adds scent and detail to arrangements for special occasions. Saponaria. An airy early-season filler with a delicate look and sturdy stems. Sage. Early, sturdy foliage from the perennial garden adds that gray-green color that is so popular. Yarrow. Sturdy, dependable, and holds very well in bouquets if cut when blooms are mature and pollen is visible. It's tempting to grab those first blooms early, but they will wilt if cut too early. 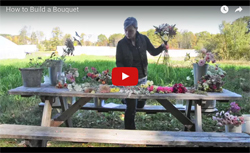 Hillary Alger, Flower Products Manager here at Johnny's, with a tutorial for designing a simple, professional-quality bouquet with focal, spike, and filler flowers. Images used with permission. Courtesy of Rain Drop Farms, B-Side Farm, Broadturn Farm, and Northwest Native Plants Database. All rights reserved.